Every year, representatives of the Suffolk Owl Sanctuary staff take part in a meeting with the local veterinary surgeon and trustees in order to review the ethical premise on which the Sanctuary’s mission statement stands. This Ethics Meeting is fundamental to our standards of practice and it’s consequent application of procedures. 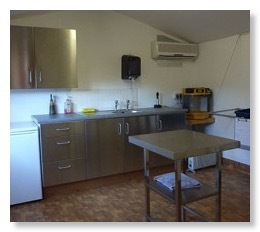 accommodation by night to foster optimum eagle health. Although the care and welfare of the resident owls and other birds of prey and wild injured hospital admissions take priority in an ethical context, health and safety reviews and public safety issues are also of necessary concern in a facility which welcomes visitors almost every day of the year. It's impossible to relate the whole gamut of discussion here but our supporters make like to be aware of the proceedings, which hopefully convey the ethical awareness and integrity which underpin all aspects of the sanctuary’s work. The care of all birds, whether captive bred residents or wild injured hospital patients, depends upon adherence to comprehensive, correct procedures and the improvement or amendment of these procedures when pertinent. to name but a few!! A responsible approach to the breeding of progeny is also upheld - birds are not bred for financial gain and breeding is dedicated to the sanctuary’s participation in the wider context of rare breed conservation. For example, this year a beautiful example of the Ashy Faced Owl has been acquired - a species forecast to face extinction within the next 20 years, without the support of captive breeding programmes and the educational amplification of its situation. Similarly, working in partnership with other conservation agencies, the sanctuary hopes to also play a part in developing dwindling populations of the Philippine Scops Owl and the Honey Buzzard. To this end, co-operation with other agencies employed in the conservation of birds of prey is recognised as essential - by actively working with breeding programmes and loaning stock to maintain healthy bloodlines, real advances can be made in the conservation status of many species. Specialist handling and/or environment is also recognised as a necessity for several bird of prey species, for example Sparrow-hawks, Ospreys, Goshawks and Harriers. These birds, with more specific needs are of great educational importance and make interesting additions to the visitor experience, but require custom built housing and special diet - both of which the Sanctuary aims to provide. In every instance, falconry staff endeavour to replicate a natural environment for the birds, both physically and mentally, allowing and encouraging natural behaviours and pairing birds wherever availability of stock and temperament of individuals allows. For example, recent renovation of the Red Kite aviaries reflects how such considerations impact on aviary design; whilst a spacious and naturalistic environment must be visually accessible to visitors, accommodation must also retain a feeling of remoteness and protection from close contact for the birds. Therefore a hatch has been built into one end of this new aviary, allowing the birds to take flight out to the display ground independently - quite a spectacle for visitors and a welcome freedom from constraint for the birds. 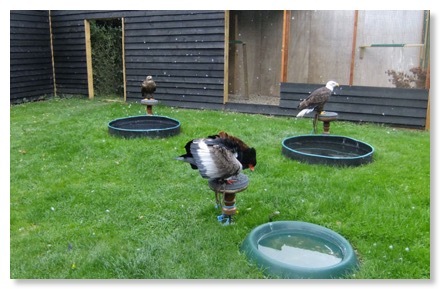 A feeding hatch at the rear of the aviary allows for feeding by “invisible” staff and an innovation for introducing water into the Kites' bath without trespass into their territory has been established. Goshawks are also recognised as a species requiring extra care - they receive a strictly regulated diet and are provided with special perches and tail guards to protect feathers during confinement to aviaries. * address additional public needs to this end e.g. braille overlays on signage, wheelchair accessible picnic tables, wheelchair accessible playground equipment, raised flower beds. All of these initiatives hopefully fulfil the centre’s obligation to both birds and visitors, to provide a natural, safe, clean, stimulating and healthy environment in which raptors and humans may experience each other at close quarters without causal stress or intimidation. signage, safety barriers and level paths assist visitors. The centre is inspected annually by Mid Suffolk & Babergh District Council and every six months by a local veterinary surgeon and avian specialist. In this context, the current status of the ethical standards of the sanctuary have been adjudged as above and beyond expectations for an establishment of our size. We hope that visitors will continue to enjoy all aspects of the Sanctuary’s work, safe in the knowledge that it is built upon aspirational foundations of integrity and ecological awareness.